On these chilly mornings, what better way to prepare to face the day than with a hearty bowl of oatmeal. In this recipe, we add the warming spice of cinnamon, nutrient and protein-rich pistachios and, of course, our favourite apple – Ambrosia, for its natural sweetness. 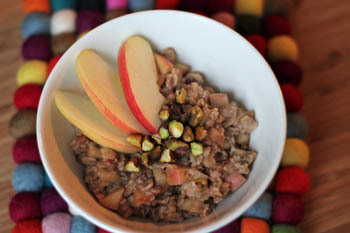 Want to know what oatmeal, Ambrosia apples and pistachios have in common? They all provide a sustained energy boost (thanks to being slow to digest) and they’re full of fiber so you’ll feel full and satisfied all the way until lunch. No big sugar spike – just a steady amount of energy to get you through the morning. Plus, oatmeal and pistachios both contain protein. And, despite what you might think, making oatmeal is not a big production in the morning. We tested out this recipe and managed to make it in 15 minutes flat – from start to serving. In a small pot, sauté diced Ambrosia, chopped date and cinnamon using water as needed to ensure apples don’t stick to the pot. Simmer on low for 5 minutes, stirring frequently. Add oats, hot water and salt. Bring to a boil then reduce to simmer on low for about 10 minutes or until oats are the desired consistency. Don’t forget to stir! Transfer to a bowl and top with toasted pistachios. If oatmeal is too thick, stir in a little of your favorite type of milk. One last note. Many people enjoy oatmeal with a bit of brown sugar on top but with the dates and the sweetness of the Ambrosia apples, you likely won’t need it!